Composer/pianist CARTER PANN (2016 Pulitzer Prize Finalist in Music) has written for and worked with musicians around the world, garnering performances by ensembles such as the London Symphony and City of Birmingham Symphony, the Tchaikovsky Symphony in Moscow, many radio symphonies around Europe, the Seattle Symphony, National Repertory Orchestra, the youth orchestras of New York and Chicago, and countless wind ensembles. 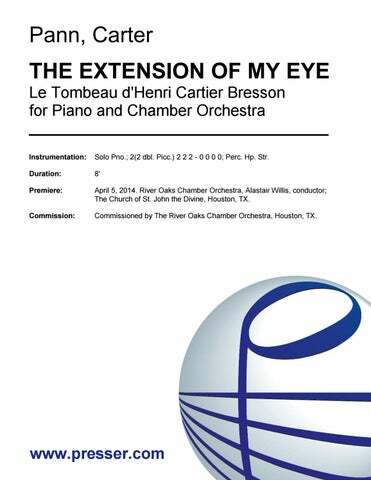 He has written for Richard Stoltzman, the Antares Ensemble, the Capitol Saxophone Quartet, the West Coast Wind Quintet, the River Oaks Chamber Ensemble and many concert pianists. His String Quartet No. 2 “Operas” was commissioned by the Takács Quartet to premiere in the 2015-16 season. Pann has been awarded a Charles Ives Fellowship, a Masterprize seat in London and five ASCAP awards over the years. 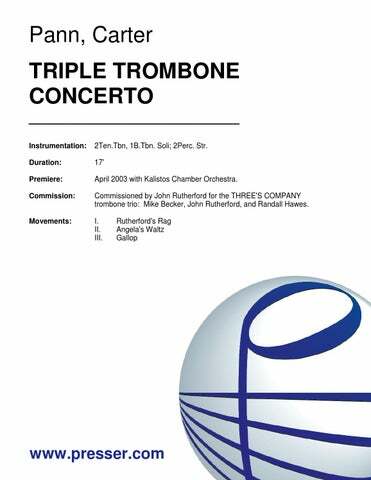 His numerous albums encompass solo, vocal, chamber, orchestral and wind music and have received two Grammy® nominations to date. He currently teaches at the University of Colorado in Boulder. 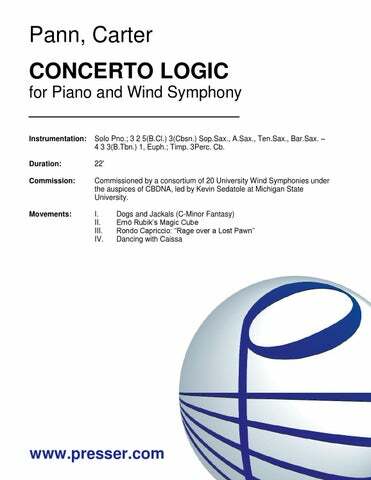 For Piano and Wind Symphony 22:00 Solo Pno. ; 3 2 5(B.Cl.) 3(Cbsn.) Sop.Sax., A.Sax., Ten.Sax., Bar.Sax. – 4 3 3(B.Tbn.) 1, Euph. ; Timp. 3Perc. Cb. for Wind Symphony 16:00 Picc., 6(1,2 dbl. Picc.) 3(E.H.) 8(Eb Cl., B.Cl.) 3(Cbsn. ), S.Sax., A.Sax., T.Sax., Bar.Sax. – 4 6 3(B.Tbn.) 2Tu. 2Euph. ; Pno. Cb. ; Timp. 4Perc. A Symphony for Winds 29:00 7(Picc. ), 3(E.H.), 8(B.Cl., Cb.Cl. ), 3(Cbsn. ), S.Sax., A.Sax., T.Sax., Bar.Sax. – 6 6 4(B.Tbn.) 4(2 Euph. ); Pno/Cel., 2Cb., 2Hp., Timp., 2 Crystal Goblet, 4Perc. Arrangement for Wind Ensemble 10:00 5(Picc.) 3 9(Eb Cl., 2B.Cl.) 3(Cbsn.) – 4Hn. 6Tpt. 3(B.Tbn.) 3Euph. 3Tu. Timp. 3Perc. Pno.(Cel.) Hp. Cb. 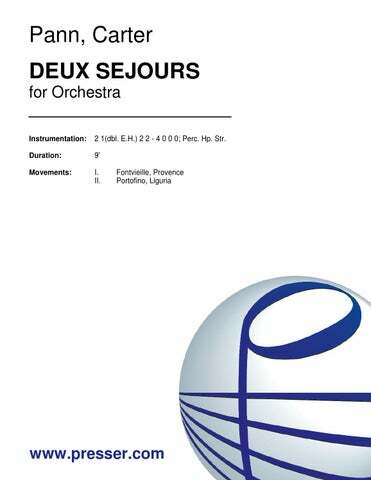 for Orchestra 9:00 2 1(dbl. E.H.) 2 2 – 4 0 0 0; Perc. Hp. Str. 10:00 3(Picc.) 2 2(B.Cl.) 2(Cbsn.) – 4 3 3(B.Tbn.) 1; Timp. 3Perc. Pno.(Cel.) Hp. Str. for String Orchestra 22:00 Str. 12:00 3(Picc.) 3(E.H.) 4(EbCl. B.Cl.) 2 – 4 3 3(B.Tbn.) 1; Timp. 5Perc. Pno.(Cel.) Hp. Str. 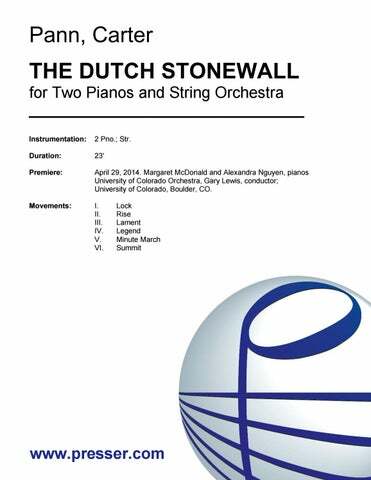 for Two Pianos and String Orchestra 23:00 2 Pno. ; Str. Le Tombeau d’Henri Cartier Bresson (1908-2004) 8:00 Solo Pno. ; 2(2 dbl. Picc.) 2 2 2 – 0 0 0 0; Perc. Hp. Str. for Flute and Large Chamber Ensemble (or Orchestra) 23:00 Solo Fl. ; 1 2 2 1 – 2 1 0 0; Timp. 2Perc. Hp. Str. Two Symphonic Dances for Clarinet and Orchestra 11:00 Solo Cl. ; 2(dbl. Picc.) 2 2(dbl.B.Cl.) 2 – 4 2 3(B.Tbn.) 1; Timp. 3Perc. Pno.(Cel.) Hp. Str. 17:00 2Ten.Tbn, 1B.Tbn. 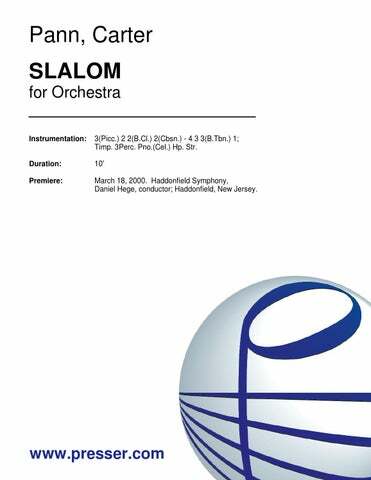 Soli; 2Perc. Str. With a distinctive American flavour, the first movement, Strand, is highly rhythmic with constant changes of time signatures and a pop music feel. Following is a reflective and expressive movement and a cadenza highlighting the upper regions called Air. The middle movement, Country Dance, is in an American hoedown style with double stops and glissandos. The fourth movement Blues has a distinctive jazz feel to it. The work concludes with Song, reminiscent of a dramatic Broadway melody. …Pann writes skillfully for cello [and] creates ‘moods’ through a mix of lyricism, rhythm and contemporary idiom. 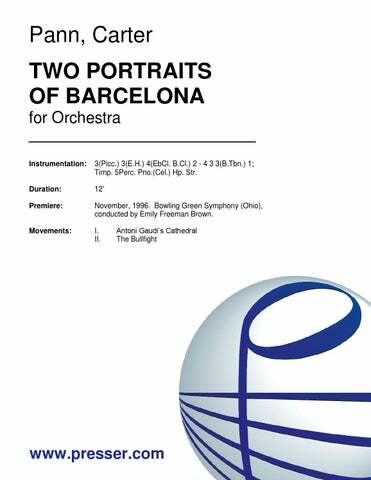 Antoni Gaudi’s Cathedral [from “Two Portraits of Barcelona”] is the most appealing music … It’s an effective sound picture with tolling bells and atmospheric effects.